This title is directed primarily towards health care professionals outside of the United States. 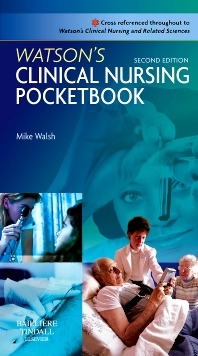 It is the essential practice companion to Watson’s Clinical Nursing and Related Sciencesand is designed to be carried in the pocket whilst on duty. It is invaluable for quick access to the key facts needed during clinical practice. By incorporating care from the primary health perspective, it is equally useful as a rapid read in community settings. Each chapter follows the same structure for each body system and is well supported by diagrams and charts. The inclusion of anatomy and physiology in each section assists the student to make links between the relevant systems, diagnosis and patient care. Each section contains a list of signs and symptoms of the most common and serious conditions indicating possible complications thereby assisting students in the development of vital assessment skills. Medical management explains what the doctors are doing. Pharmacology focus summarises the main medications in use. Nursing care priorities outline the important elements of care. Ten top tips list the things you should never forget in caring for patients with the conditions described in each chapter. The user-friendly size, layout and design makes it quick to access to the relevant information.